There are days when nothing will do. My apartment’s not big enough, my clothes don’t fit right, and my boyfriend is just plain messy. And then there are days when all I need to satiate every possible need in my life is tangible, inexpensive and sitting in my cupboard. I’m talking about chocolate, that sweet gift from the gods that makes everything wrong in the world somehow seem okay. It has the ability to turn a downright awful day into an alright one, a heavy argument with your boyfriend into an obscure event, and a sore tummy into a bloated but happy one. This recipe is revered in my house as the ultimate chocolate-craving soother. Without a doubt, it comes out every couple months in my mom’s kitchen, generally in the colder months, on “one of those days.” It’s a warning sign; when the wacky cake comes out, you stay your distance. My mom’s a sweet woman, but my God, don’t mess with her when she’s got cocoa on the table. This cake’s most redeeming quality is its simplicity, but that’s also what makes it so delicious. It doesn’t try to mask its function by pretending to be fancy and ‘gourmet.’ You can dress it up if you like, but it’s essentially just pure, unadulterated cocoa. It’s pretty much impossible to screw up wacky cake, which is handy given that most times it comes into use, I’m distracted by anger, tears or some other tragedy that requires nothing but chocolate. There was no real reasonable requirement to make this cake tonight (do you ever really need a reason for chocolate? ), but I kept thinking about it all day, and nothing else would hit the spot. I tried regular old chocolate bars, but all the nuts and caramel just got in the way of what I really wanted, which was chocolate. The icing is optional – it’s great if you’ve got time or need that extra bit of chocolate, but the cake takes on a more brownie-like quality without it. It’s also impossible to ruin. Proof in point: I left it on the stove whilst writing this very blog and completely forgot about it for a good five minutes. A little heavy stirring and we were back in business, neither of us worse for wear. 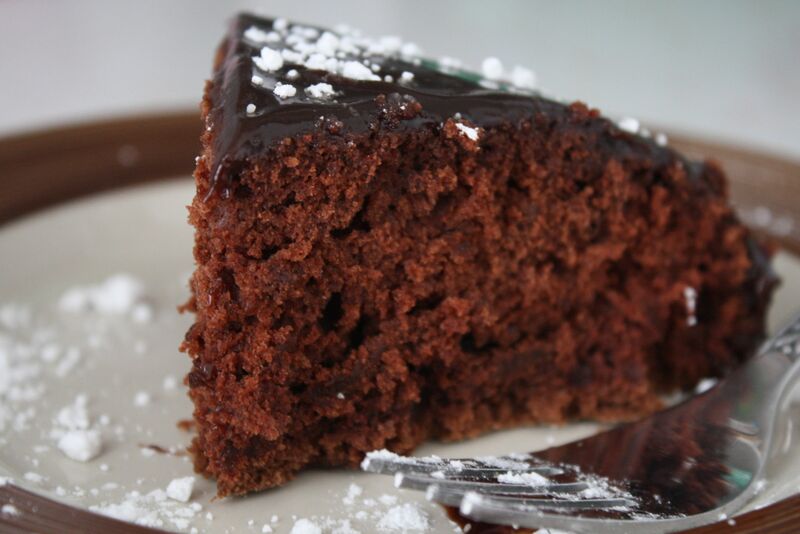 A note on the icing: it’s best to leave the cake in the pan while you’re icing it, as the icing is very runny and will pour over the edges; the pan catches the icing and lets it sit evenly on top of the cake. Combine cake ingredients in a large mixing bowl, starting with the dry ingredients. Mix well. Pour into lightly greased and floured cake pan and bake at 350 degrees Fahrenheit for 25-30 minutes, or until a toothpick comes out clean when inserted in the middle. Cool on a wire rack. While cake is cooling, mix sugar and corn starch together in saucepan. 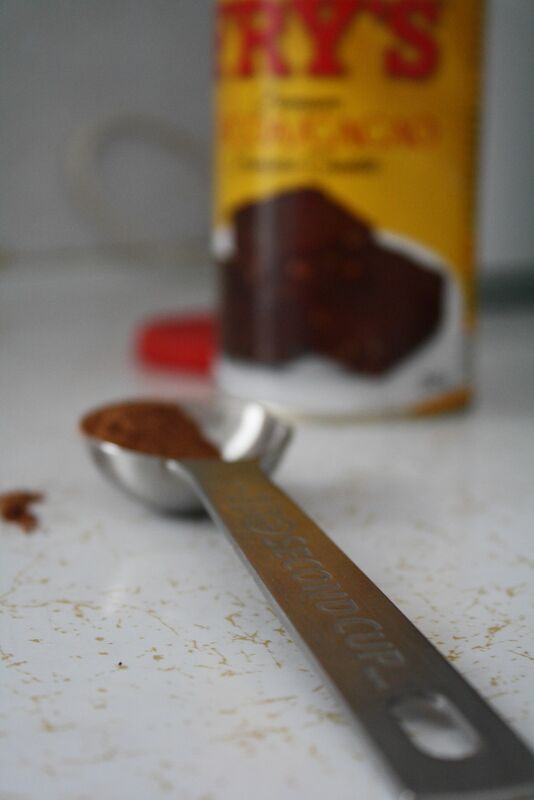 Add cocoa, salt, and water and cook until thick. Remove from heat and stir in butter and vanilla. Spread on top of cooled cake while hot.